A few days ago Barbara called me into the living room and said, "Watch this," as she rewound the Tivo and played back a Hertz commercial advertising their new "Green" rental program. In it they talk about their new fleet of low carbon impact vehicles. 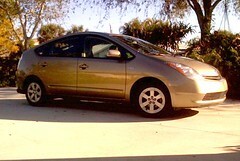 Since we have long been curious about the Toyota Prius I picked up the phone and reserved one for us to evaluate. We picked it up today. On the way home from the rental agency I noticed that we averaged 52.6 mpg. Not bad. About the biggest challenge was figuring out how to make the thing go. It has no transmission as such. It has no starter. I suppose we are used to complexity because it took me a while to figure out that the big round button on the dash labeled "Power" was the trick. So, first impressions can be summed up by Barbara who after driving it said, "That is about the strangest vehicle I have ever driven." Why so strange? The eerie silence when it starts off in electric power for one thing. Another is the unnerving shutdown of the engine when you pull to a stop. If you happen to be running on engine power, it switches seemlessly from engine to electric, the engine will just shut down when you stop. It is unnerving because being used to conventional cars the first reaction is to reach for the ignition switch but of course there is not one. The gauges are embedded at the base of the windshield almost like a heads up display on a jet fighter. They are bright, large, and easy to read. The central display unit in energy mode does remind one of the Starship Enterprise with all of its energy arrows showing flows to and from the battery and the engine. The radio and AC controls embedded in the steering wheel hub are nice and easy to use. The interior would be disappointing to a luxury car enthusiast. At least in our rental version the furnishings of the cabin are quite Spartan. Not sure if that is for weight savings or if it is just the version purchased by Hertz. This is a great way to evaluate cars and just plain fun too. Some people even get paid to do this kind of thing but we figure living with various cars in this way for a week at a time is far better than a round the block demo at the dealership. We are having fun and will continue to report on our experience over the next week. Oh, and so far that 52.6 mpg average is not bad.